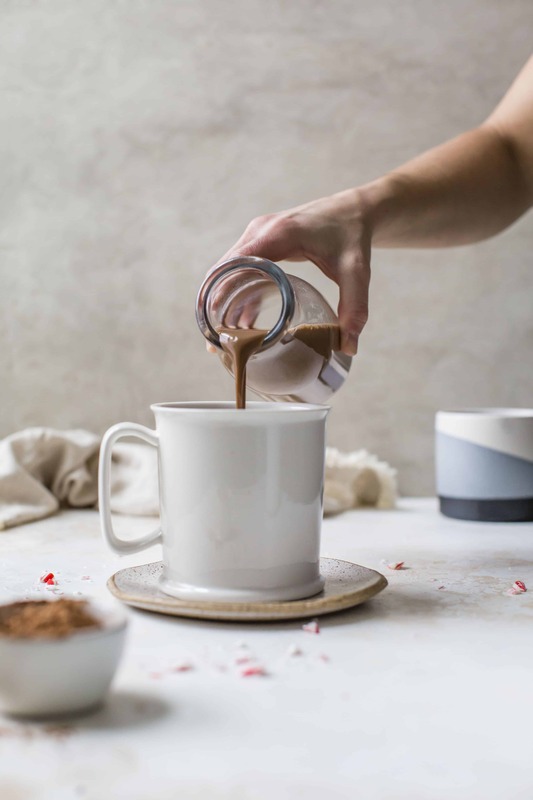 This quick, easy Dairy-Free Peppermint Mocha Coffee Creamer is the perfect healthy way to dress up your coffee this holiday season. It was only a matter of time before I brought you something peppermint this month. Let’s be real. That is in fact exactly how I like my coffee. ☕ Drowned in the creamy goodness of unsweetened cashew milk. For now at least, until another nut milk of some sorts hits the shelves. Or if I start making my own… hhmmm. Then the possibilities are endless. But I digress. Back to milk in my coffee. And a splash of coffee creamer, every so often. Typically I will actually do both creamer and milk… is that weird? Does anyone else do that? OH EM GEE. 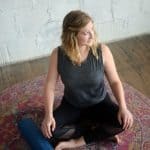 Has anyone been to Australia/lives in Australia? I studied abroad there during my junior year in college and you could buy COFFEE MILK. Literally by the gallon. And not just like your Starbucks or International Delight latte cartons or whatever the heck those things are with tons of ingredients. Coffee milk was right next to the regular milk and chocolate milk. It was pretty much heaven. I miss being able to buy coffee milk… not to mention my gym cafe had the best banana smoothie of my entire LYFE. I’m not going to lie to you, I haven’t (and still don’t) ALWAYS make my own coffee creamer. Every so often I will buy almond or coconut milk coffee creamer, and every time I literally think “Why am I buying this? I can just as easily make my own. And it is probably cheaper, plus fewer ingredients…” (Basically how I feel about granola.) But yet the darn thing still finds its way into my cart. Especially when there is a sale. BUT NOT THIS TIME. 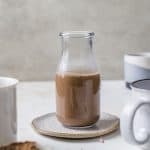 Which is why this peppermint mocha dairy-free coffee creamer came about! 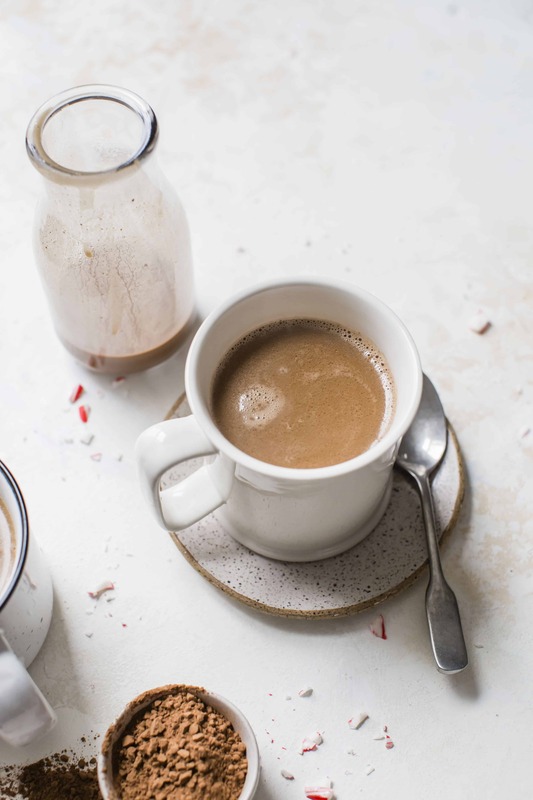 What I love about this DIY peppermint mocha coffee creamer is that it is free from allll of that unnecessary stuff. Plus it is naturally dairy-free, vegan, sweetened with just a hint of coconut sugar, and contains healthy fats from the coconut cream. I’d say this healthier alternative is a win-win-win. All the chocolate-y peppermint-y goodness in your morning cuppa, without all the unhealthy fake stuff. 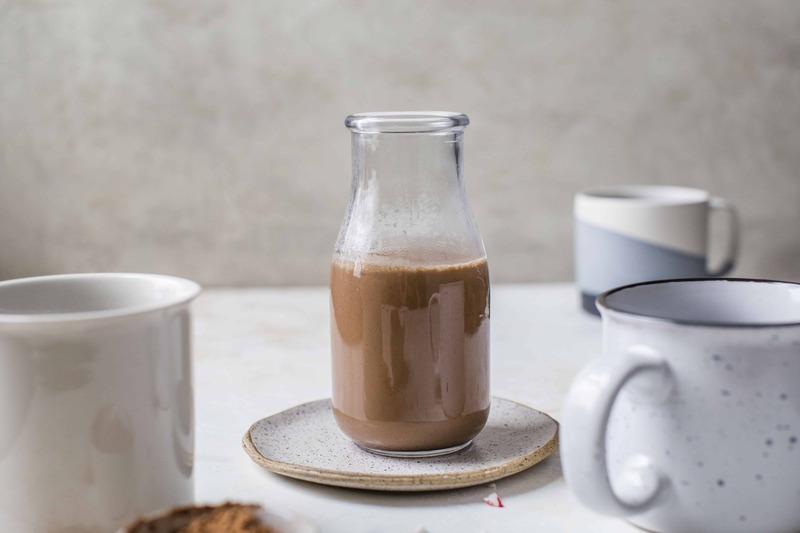 Start the morning right with this HEALTHY Dairy-Free Peppermint Mocha Coffee Creamer. In a small saucepan, combine the non-dairy milk, coconut cream and water until warm. Add in the cocoa powder, coconut sugar, and peppermint extract. 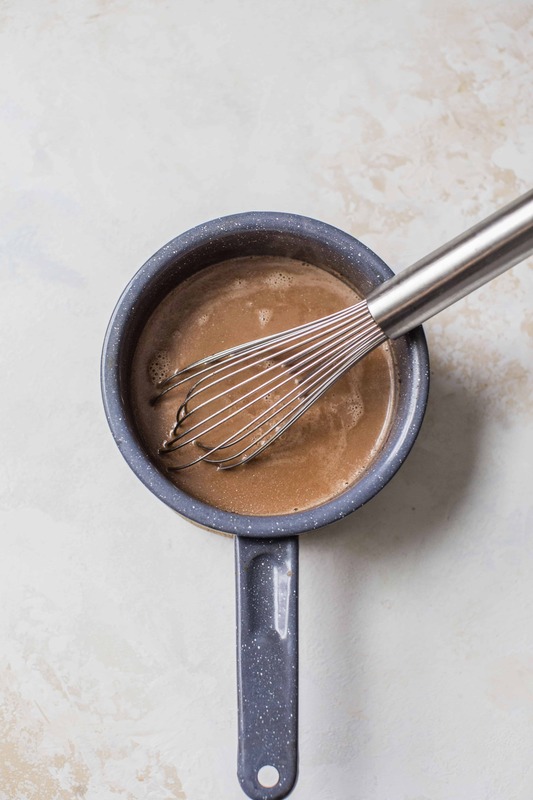 Whisk until cocoa and sugar are dissolved. Bring mixture to a boil, then let simmer for 5 minutes while whisking continuously. Let mixture cool, then transfer to jar. *I used Trader Joe’s canned coconut cream. But you can also take a can of full-fat coconut milk and place in the fridge overnight, then when you’re ready to make the recipe, separate/scoop the cream from the milk. Alternatively you could also use the full-fat coconut milk as is. *Add additional sugar, 1-2 more TBS, if you want more sweetness to the creamer. -Start with 1/4 tsp of peppermint extract (or oil) and add from there if you prefer a stronger flavor. Not too much though or it will be overpowering. Photos by: Erin Alvarez – The Almond Eater. You’re so creative! I never put creamer in my coffee (usually just a splash of skim or almond milk) but this looks great for a festive post-Christmas dinner treat or Christmas morning gift-opening fuel 😀 yumm! I’m guilty of the same..knowing I would save money and time making my own, yet not always doing it! But I do love when I get around to making my own 🙂 I bought a pumpkin spice one the other day that I’m definitely recreating in a healthier way! But this one looks DELICIOUS! You’re speaking my language here: reading nutrition labels, living abroad, PEPPERMINT COFFEE?!?! What are we? Soul mates? It appears as if we love coffee the exact same way. And I love peppermint mocha. I’m so making this, thanks for the idea Ashley! Pinning! NEED THIS!!! I usually drink my coffee with a splash of almond milk, and sometimes (like right now) just black when I am out of almond milk. But, THIS would be incredible! Tell Starbucks I’m keeping my money! Lol, I will be sure to pass the note 😉 Thanks Susie! You’re a genius. Seriously. I love the peppermint mocha at starbucks, but hate the sugar overload + yucky ingredients. I”m 100% making this for Christmas! Yay! Thanks so much Liz 🙂 I like to treat myself every once in a while, but then I just don’t like how much sugar I just consumed. Having this at home allows me to thoroughly enjoy my coffee. Plus, coconut milk fats heck yes! I am a BLACK coffee girl! I don’t want it watered down with anything! Just coffee and some flavored stevia and I’m good to go! Oh man, Rebecca. Kudos to you. I just can’t do it! I bet this would be delicious in Trader Joe’s Chocolate Peppermint Coffee that they have right now… or even their Gingerbread blend. NOM. OH HECK YES. Ugh I wish I had a TJ’s by me!! Thanks for stopping by Erica! You can by coffee milk??? I found something similar living in Spain. I’ve never been able to find it in the states. I don’t use creamer often, for the processed reason. And, I read somewhere that it can cause constipation (TMI?) so I was like meh. I’ll do without it. Although I’m sure one would have to drink an INSANE amount for it to cause BM problems. Okay this comment is getting out of hand. What I want to say is that this looks DELICIOUS, and I love peppermint/mocha/chocolate. Not to be dramatic, but I almost cried when I took a sip of my coffee after I made this! The Starbucks peppermint mocha is my absolute favorite but I not only get nervous that something with milk will end up in my drink and I’ll be sick but I also can’t justify spending almost $7 on a coffee every morning. Thank you for this recipe!! I’ve been trying to transition to a more plant-based diet but could not figure out how to replace my morning indulgence of peppermint mocha creamer in my coffee. Thank you so much for this recipe! Yay! Love that you found a good replacement. Thanks for stopping by! This looks great! I used to use coffee mate creamer, knowing it was terrible for me but loving it anyway. Now I usually just put coconut cream or thick coconut milk in my coffee. I did make my own creamer once and it was really good. I’m definitely going to try this one! What would happen if I used maple syrup instead of a dry sweetener, do you think that would work? Hi Hayley, I can totally relate! I was always a huge fan of the coffee mate creamers! But then I started to pay more attention to ingredients labels and realized there wasn’t much real food in them. But making this is so simple, filled with healthy ingredients and tastes amazing! Using maple syrup instead of a dry sweetener would work just fine – the maple syrup flavor might come through a little bit but I don’t think too much! As long as you like maple syrup I’d say you’re good to make that substitute! YES ! I live in Sensational SydneY Australia! Loving this life here after spending over 14 yrs working & living overseas after uni. So good to be back home & settle in heaven on earth. We have a 40 c plus heatwave these days so it’s great for pool weather ( that’s my Snday plan after workout & getting groceries from my whole food store:-)Recently got a shorter pixie to go with my weighloss AFTER changing to a whole food way of life ! Love Sydney and hope to come back to visit one day! This looks amazing and I am making it first thing this afternoon! Any idea how long it will keep refrigerated? It should keep about a week! It is natural that it separates so just shake it before each use. I just made this and am using it in my morning coffee as I type. Wow! This is the bomb! So good! I made this last year after starting the conscious effort to get rid of all the yucky stuff in creamers. Well, I’m back again this year in time for the holidays! So excited to have this in my fridge again, it is delicious! I even got my whole family trying it as we are all shifting away from dairy when possible. Thank you!! Amazing Stephanie! So glad to hear it’s becoming a seasonal staple 🙂 Thank you for taking time to comment and leave a review! 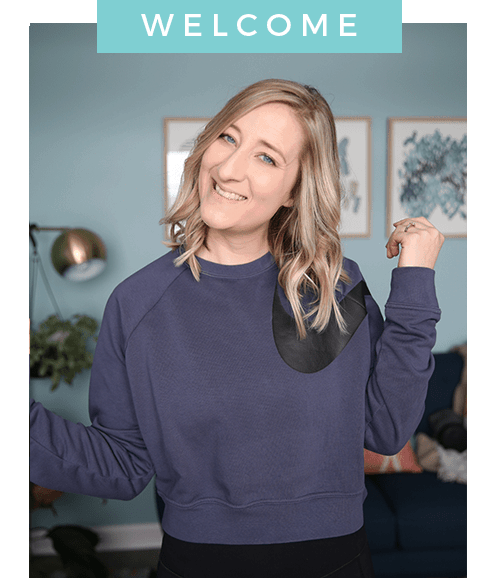 Love the idea of DIY, thank you! May I ask, how long do you find it lasts in the fridge? Perfect idea for the holidays, or yearound, let’s be honest 😛 Thanks!! I would use it within 1 week! Is there an alternative to coconut cream? I’m nursing and my son is allergic to milk, eggs and coconut. We’ve been on the no dairy basically vegan train for about two months but the almond milk creamers from the store just don’t do it for me. Oh bummer! Unfortunately here there isn’t a great alternative that I’ve found. If you can find Oatly Oat Milk, their barista blend is rich and creamy! Or honestly, homemade cashew milk and just adding in some cocoa powder, peppermint and a little sweetner may do the trick! Cashew milk stays pretty thick. Here is my “How To Make Homemade Nut Milk” post for reference! So good! That you for sharing and thank you for introducing me to cashew milk! Have a Merry Christmas and Happy New Year!